This week I’ve included some great recipes that are quick to cook…one pan goulash (did I mention easy to clean up? ), scrumptious a light and fresh salmon nicoise, a set it and forget it chili, cherry almond energy balls…plus lots more. It’s all healthful and family friendly. 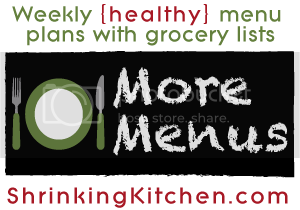 It’s healthy menu planning made simple. Wednesday: Easy Mongolia Beef with brown rice & steamed green beans. Thursday: Avocado Breakfast Tostada with fresh melon. This recipe has been quadrupled to serve 4. Make each tostada individually.